To celebrate the 150th anniversary of Christ Church we have a project to make the church a place that falls into the must-see category amongst local attractions. Looking to the future by honouring the past. A few months ago the vestry considered what to do about the forthcoming 150th anniversary – there was a rather awkward silence and we decided that ‘something would come up’. Well, it seems it has. Our vision is to make Christ Church a ‘must see’ place to visit. Why would anyone bother about that? I hear you ask. Is there anything to see? Christ Church is quite a pretty little church, inside and out. It has nice stained glass windows and, er, that’s it – a five-minute visit should cover it? Well no. Let’s look again. If you were to visit and were informed about each of the windows, many of which take a passage from the bible as their theme, and about the symbology within the windows – would that not be of greater interest? Why, for example, are whole heads of wheat strewn on the floor of the stable in this nativity scene? What about the memorials? The brass plaques, gravestones and window dedications could just be a list of names of dead people but if we told you that one of these was Captain of HMS Victory; or that another was killed in the Great War when a converted ocean liner cut his destroyer in half; or that another won no fewer than three DSOs during the Great War - would you not want to know more? That interest could be raised yet further if we were to have other uplifting words and perhaps artwork on the plain walls. Very soon we could have a church where a 30 minute visit would be too short. We ask you to imagine that this delivery of information about the church was coupled with automatic energy-efficient lighting which came on for visitors, and when the church was empty small lights in the windows shone their image and message to the outside world. Perhaps too if that visit was coupled with sacred music playing would you not be tempted to linger a little longer over a visit? Would you not be tempted to recommend a visit to Christ Church as being something to do in the locality? By the time the Bishop visits us to commemorate our 150 years in August this could all happen. We have actually made a start. Instead of locking the church between Sunday services the church is now open, daily. Already we have a few notices in the church which describe the windows and a few of those commemorated in the memorials. More will follow. At present the notices are merely laminated printouts. Once we’ve settled on the text we could make these notices more permanent with better materials and formatting. We are beginning to work on a lighting plan which, coupled with what has been described above, could also help us see the words in the hymn books at our services. ​Please participate in this scheme. If you have information about anyone named in the windows, the memorial plaques or gravestones please let us know and we shall try and tell their stories. Your help and input to this project would be much appreciated. 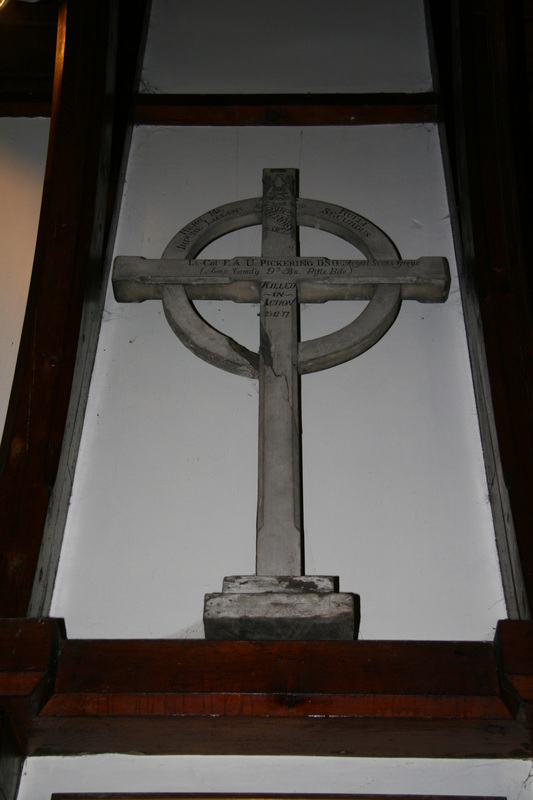 This cross came from a War Grave at Paschendaele, near Ypres. Rector's Memorial hides a tragedy. Rev. 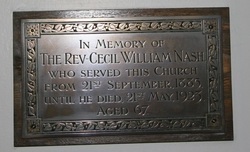 Nash was rector of Christ Church for over 35 years. This plaque does not reveal that his son was killed in 1918 in the Great War when serving with the RAF. However a beautiful window opposite the plaque commemorates his son, Thomas. 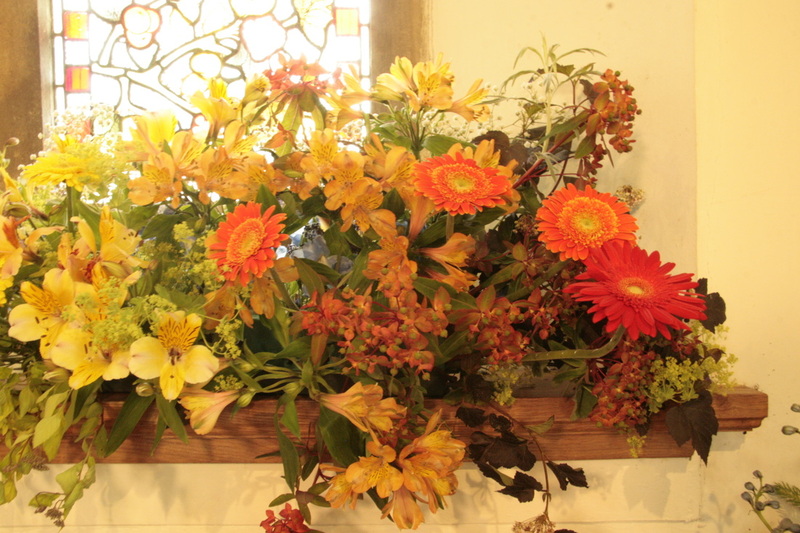 In 2015 a Flower Festival at Christ Church raised over £800 for Kincardine O'Neil Primary School.